Pop Art girls with speech bubble. Party invitation. Birthday greeting card.Vintage advertising poster. Comic woman with speech bubble. girls. 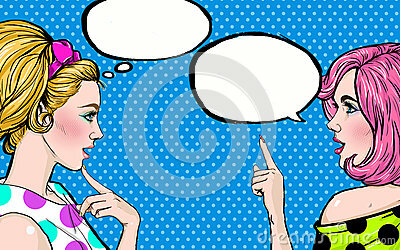 Gossip girls with speech bubbles. Hand drawn girl with two faces and speech bubbles. Tattoo theme. Vector illustration. Young Women Meeting and Friendly Conversation.